I have received many questions about what the actual process of receiving the chemotherapy treatment is like. So, I decided to do a quick blog post about it as I receive my treatment. Above is a photo of the infusion room. I counted 40 chairs in the room. No matter when I have received treatment, they are almost always completely occupied. This is sad to me that this many folks have cancer. Most of the folks are a lot older than me. The demographic distribution of patients in the room at one time appear to be a majority female, with a few men, and maybe one other younger woman (usually in her late 30's/ early 40s). It seems I am always the youngest one in the room though. I have received chemo on a Thursday, Monday, and Tuesday and it appears there is never a "slow day." You will notice a lot of pillows and blankets. They keep this room frigid! I noticed today the thermostat was set at 55 degrees. Brrrrr. I do like the warm blankets they give you though. I would bring my own, except I wouldn't want it to get dirty. Also, the ones they provide have been warmed in a blanket warmer. You will notice televisions. You can watch TV, and they provide you with headphones as well. But, I usually just bring a lap-top, because they provide free wi-fi. This place is hopping with a large team of medical staff that attends to your every need. The medical staff sits behind a large area as pictured below. They can see all of the patients from there. There is also a little snack area that you cannot see at the bottom left of the photo. 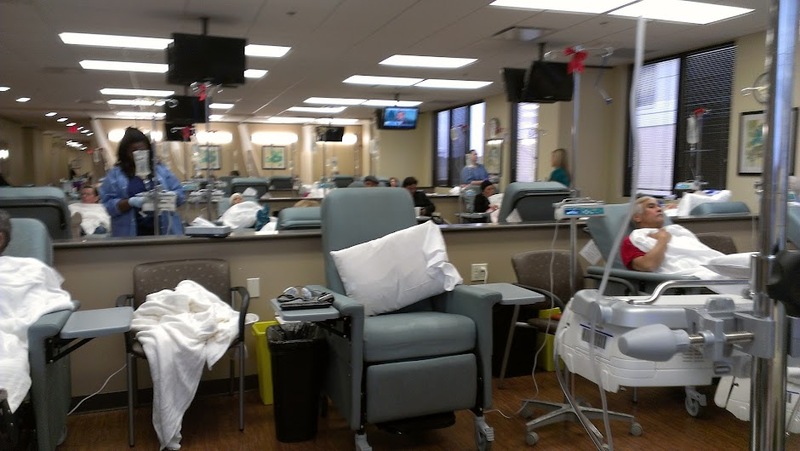 Here, they stock coffee and hot tea, water, and a few snacks (peanut butter crackers and chex mix--which I can never eat again thanks to eating them during my first chemotherapy treatment). The first thing they do when I arrive is get me situated (with blankets and pillow(s)) and then access my port. This port is so weird. They flush it first and then draw blood. So, I watch them push fluid in with the syringe and then, using the same syringe while still poked into my port, they draw blood on the way out. They then flush the port again and begin fluid via iv while we wait for my cbc results. I can taste everything they push into the port, which is the strangest feeling. I usually try to place hard candy or dark chocolate into my mouth before they do this, in order to mask the terrible taste. My power port is implanted on my right side. (See the photo below). You can see the catheter going up into my jugular vein. The catheter terminates in my superior vena cava, just upstream of the right atrium. My port, which is being accessed for chemotherapy. You can still see the incision area above the port, from the originally surgery when it was implanted. It is having trouble completely healing because I started the chemo treatments the morning following the port implantation surgery. I don't think my white blood counts have been high enough for long enough to completely heal the scar. A port consists of a reservoir compartment (the portal) that has a silicone bubble for needle insertion (the septum), with an attached plastic tube (the catheter). The device is surgically inserted under the skin in the upper chest or in the arm and appears as a bump under the skin. It requires no special maintenance and is completely internal so swimming and bathing are not a problem. The catheter runs from the portal and is surgically inserted into a vein (usually the jugular vein, subclavian vein, or superior vena cava). Ideally, the catheter terminates in the superior vena cava, just upstream of the right atrium. This position allows infused agents to be spread throughout the body quickly and efficiently. The septum is made of a special self-sealing silicone rubber; it can be punctured hundreds of times before it weakens significantly. To administer treatment or to withdraw blood, a health professional will first locate the port and disinfect the area. Then he or she will access the port by puncturing the overlying skin with a 90° Huber point needle although a winged needle may also be used. (Due to its design, there is a very low infection risk, as the breach of skin integrity is never larger than the caliber of the needle. This gives it an advantage over indwelling lines such as the Hickman line.) Negative pressure is created to withdraw blood into the vacuumized needle, to check for blood return and see if the port is functioning normally. Next, the port will be flushed with a saline solution. Then, treatment will begin. After each use, a heparin lock is made by injecting a small amount of heparinized saline (an anticoagulant) into the device. This prevents development of clots within the port or catheter. The port is covered in a dressing to protect the site from infection and to secure the needle in position. It usually takes about 15 minutes for me to find out the results of my labs, which determine whether I will get to receive my chemo treatment for the day. The number they always watch is the ANC (absolute neutrophil count). Yesterday, my ANC was .6--lower than the needed 1.5 So, I received my first neupogen injection. Neupogen's purpose is to stimulate the bone marrow to produce more white blood cells. This morning, my ANC was 2.5, so I was able to receive treatment. I guess it worked! My lips began to swell last night, about 5 hours after the Neupogen injection, but I took a benadryl and the swelling subsided. In my chemo chair, happy that I get to receive treatment. Before you receive the actual chemo drug, they pump you full of other medications. With the Taxol treatment, I receive a number of anti-nausea drugs (including Pepsid), as well as Benadryl and steroids prior to receiving Taxol. After these have been given (this takes about an hour), I begin the slow drop of Taxol. The Taxol drip takes about two hours to complete. The actual chemo infusion process is something I really enjoy. I am sure a lot of folks think that is weird. Actually, a lot of people have asked me, "what do you do during that time?" or "isn't it terrible having to sit there for 4 hours?" Actually, no. I am sure that any mother of small children can really understand this. This is my "me time." I never really get me time except during my chemo infusion. It is a time for me to catch up on my to-do list, blog, do some online Christmas shopping, pray, read, etc. 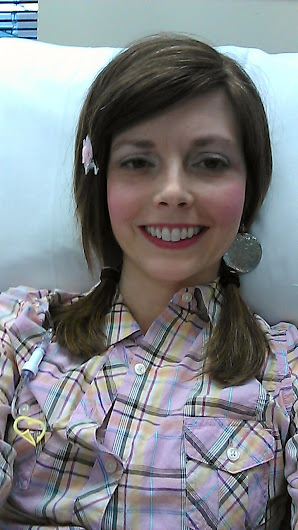 During the evening that I receive chemo, I feel really strange. The "chemo brain" thing really kicks in during this time. I say some things that really make no sense and I have a little difficulty with short-term memory. But, that seems to subside after day 1. The massive amounts of drugs that are in my body keep me awake at night. I usually sleep for about 3 hours that night--and the sleep is broken up into 20 minutes here, 20 minutes there, etc. It is never a continuous 3 hours of sleep. That makes the following day pretty tough. But, I usually sleep pretty well that next night and begin feeling like myself during the mornings. By afternoon, I am wiped out. I feel like I have the flu, with aches all over my body and extreme weakness. But, I have not experienced any nausea with this chemotherapy. And, my weight is holding steady--not losing or gaining. I did get down to 98 lbs a couple of weeks ago, even though I was eating plenty. This scared me a bit, but I soon gained the few pounds lost back and now am back to normal and holding steady. So, overall, I feel great considering I am going through chemo. I have 2 rounds of AC and 3 rounds of Taxol behind me already! Time has really flown by quickly. Now, I have 9 more weekly Taxol treatments (including today's) and then we may pick up the last two round of AC (infused every three weeks). Then, we'll have surgery and radiation and then reconstructive surgery remaining. So, I am hoping and praying that this cancer will be beaten and a thing of the past by this time next year. I appreciate you continuing to lift us up in prayer! Love your Christmas photos (I also decorate in red and gold) : ) Glad to hear you were able to receive your Taxol treatment today. Praying for complete healing. Are you sure you weren't a school teacher?!? You took something I imagine to be kind of scary and explained it in such an non-intimidating way. Glad to hear you didn't have to get off schedule too much! Full speed ahead to being cancer free!